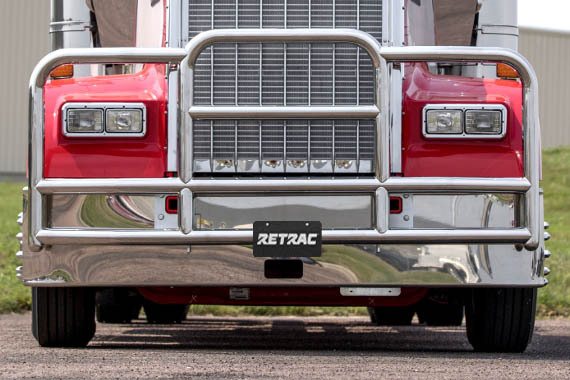 Give yourself the confidence to own the job and the road with the RETRAC ProTec™ grille guard. This hardworking front-end protector is designed to give your heavy-duty truck or semi complete bumper, grille and headlight protection. ProTec™ features rust-resistant construction, two tough finish choices, a no-drill install and the ability to convenient fold down whenever necessary. 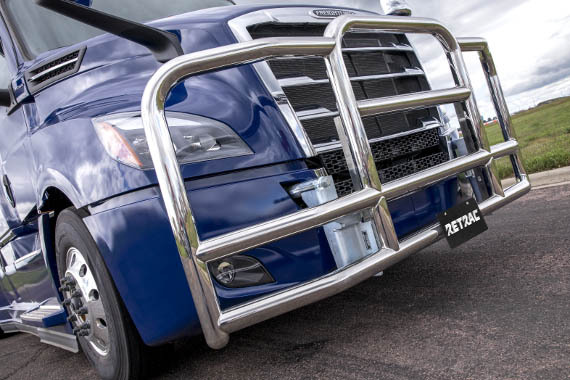 While other heavy-duty grille guard may serve as excellent bumper protectors or even offer some grille protection, nothing protects like the ProTec™. 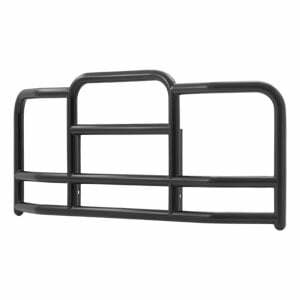 This grille guard features a multi-level stacked design. 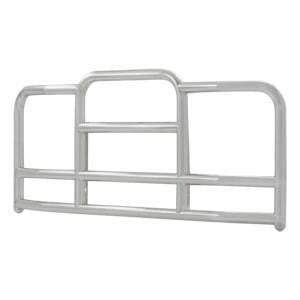 The bumper is protected by dual horizontal tubes and four vertical tubes for maximum strength. The grille is protected by a full-height brush guard with an extra horizontal support, while the headlights of the truck are guarded by two generous side brush guards. Each of the tubes feature a 3" diameter and are welded into place to make the ProTec™ a single piece for maximum strength. To give your heavy-duty truck a professional touch, the ProTec™ grille guard is available in two material and finish options. The first is a 14-gauge stainless steel with a high-polish finish. 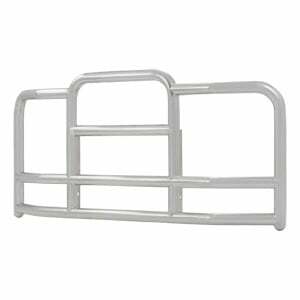 Stainless steel supplies the grille guard with strength while easily outlasting rust despite the elements. The polished finish gives the grille guard a bright, mirror-like shine and complements other polished or chrome accessories on the truck. For maximum strength, the ProTec™ is also available in carbon steel. The tubing is an 11-gauge steel and comes with a highly durable textured black powder coat finish. This finish easily resists rust, chipping and scratching, and it offers a sleek professional look. To maintain the full functionality of your heavy-duty tractor-trailer, the ProTec™ mounts with folding brackets. These brackets feature a pivot point that allows the entire grille guard to fold down and away from the truck, providing easy access to the grille and under the hood. The folding brackets are also equipped with a latching system that keeps the grille guard securely locked in place in the upright position during travel for reliable safety. ProTec™ grille guards are compatible with either our standard brackets or MagLatch™ brackets (safety pin #206940 required with MagLatch™). Installation of the ProTec™ grille guard is fast and easy. The mounting brackets are all made vehicle-specific, meaning that the grille guard can be installed with a custom fit without having to drill or modify the front end. They are designed to perfectly fit each unique vehicle application and use pre-existing holes to make installation as fast as possible. 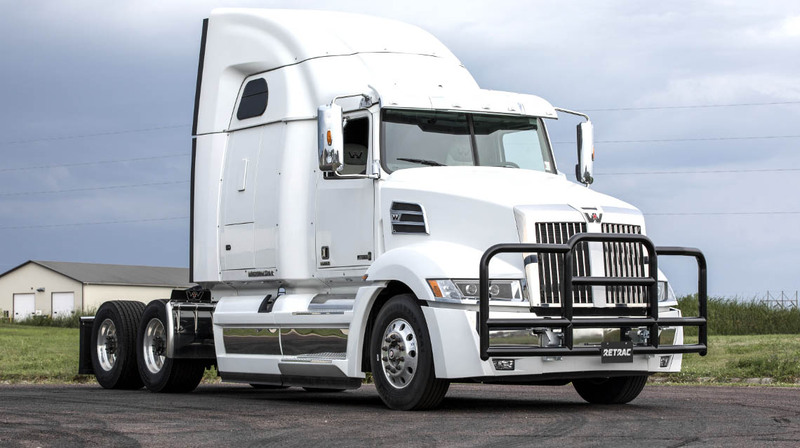 To better accommodate the shape and style of each heavy-duty truck, the ProTec™ comes in two configurations -- one with 15-degree bends in the side brush guards and one with 25-degree bends. These configurations are recommended in the RETRAC application information, depending on the specific vehicle application.